Northwoods Remodeling has been protecting homes from harsh weather for more than 30 years. We have been leaders in adopting the right technology for the right situation. We offer GAF/ELK and Owens Corning shingles with proven long-term performance. Northwoods Remodelers will apply their knowledge to your situation, discuss any concerns and leave your home beautiful and protected. Let Northwoods Remodelers beautify, protect and increase the value of your home with exterior renovations. With a new roof and architectural shingles, and siding, you can give your home a fresh new appeal plus add distinctive beauty and weather resistance. Whatever the material or the manufacturer, Northwoods Remodelers skilled crews can install it. Nothing will impact the appearance of your home more dramatically than the exterior siding you choose. As you shop for exterior siding, look for a siding material that suits the style of your house and also fits your lifestyle. Northwoods Remodelers provides you with multiple styles, colors and brands of exterior siding to match your home or business appearance. Whether you choose wood, vinyl, aluminum, steel or Fiber cement, we can provide the option that accents your home. Our installers have the experience to provide professional installations from start to finish with all siding styles. We also provide exterior trim for your soffit, fascia, windows and doors. This will complete your desire for a low maintenance home allowing you enjoy your home for many years. 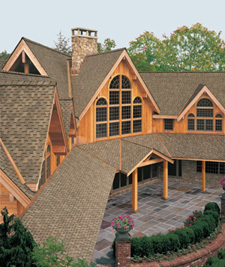 Northwoods Remodelers offers GAF/ELK and Owens Corning shingles with proven long-term performance. Northwoods Remodelers will apply their knowledge to your situation, discuss any concerns and leave your home beautiful and protected. Age –Typical shingle roofs last 12 to 20 years. There is variation in life due to shingle quality, color, sun exposure and ventilation under the roof. Appearance – If you have shingles that have broken off, or look buckled or warped, or have lost some of the granule surfacing, it may be time for replacement. Leaks – Probably not the best way to find out. By the time you see evidence of water leaking inside the house, it has probably been leaking for quite a while prior. This leaking can cause expensive structural damage to the rafters and the boards on top of them, not to mention the damage to your ceilings and walls. It is usually much less expensive to replace a roof before you see leaks.